You will be picked from where you stay to start your journey to Alexandria. It is about three to four hours to get there. 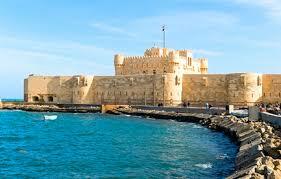 When you arrive there, you will visit the most popular highlights of the city such as the library of Alexandria (open court and free libraries ), the citadel of Qaitbay from the outside, and the Pompey’s pillar and if there is enough time to visit the Al Montazah palace of the king Farouk with a free walk, you will do it. Lunch will be served at local restaurant. 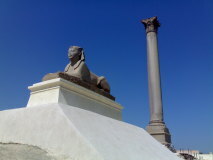 Alexandria is the second largest city of Egypt with a population of more than 15 million people. It was the capital of Egypt during the Graeco-Roman period, and the center of the Hellenistic civilization for about 500 years. The citadel of Qaitbay was built in 1477 AD by Sultan Al Ashraf Sief el Din Qaitbay. The citadel was built on the site of the famous Lighthouse of Alexandria, which was one of the seven wonders of Ancient world. Sultan Qaitbay was born in 1423 AD. He was a Mamluke bought by Al Ashraf Bersbay. Then Sultan Djamqaq bought him and give him freedom. Qaitbay occupied various posts. He was the chief of the army during the rule of the Sultan Tamar Bougha. When Sultan was dethroned, Qaitbay was appointed as a Sultan in 1468 AD, and ruled for about 29 years. Qaitbay was fond of art and architecture. The construction of this citadel started in 882 AH. Pompey’s pillar is a Roman column in Alexandria, and the largest of its type constructed outside of the imperial capitals of Rome and Constantinople. The column was made of Aswan granite. It is about 27 m high. The column was built in 297 AD, commemorating the victory of the Roman Emperor Diocletian over an Alexandrinian revolt. It is wrongly dated to Pompey. It is one of the largest libraries of the world. 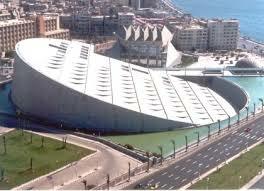 It is located on the shore of the Mediterranean sea. It is both a commemoration of the library of Alexandria that was lost in antiquity, and an attempt to rekindle something of the brilliance that this earlier center of study represented. The library was officially inaugurated in 2002. It contains books in Arabic, English and French. In 2010, the library received a donation of 500,000 books from the National Library of France. The library as well has very important Internet Archive Partnership to preserve heritage for future generations and to provide universal access of human knowledge. The library provides access to print on demand books via Espresso Book Machine. Entrance fees for the included sites.